Weber now rather famously announced their new 60020 The Ranch Charcoal Kettle Grill as a version of the Original Kettle “on Steroids”. It was a quite bombastic statement at the time and it still is, but having spent some time with it, I see that they have a point. It’s basically a blown up giant version of the Original Kettle with maxed out features for buyers who need a little more quality and want to spend more. Weber where very excited about this. In fact they issued gushing praise for the 60020 before it was even released and went to great lengths to advertise it as the next best thing in outdoor grilling. They weren’t wrong. Now, it’s priced at around 1200 dollars, which is pretty steep. 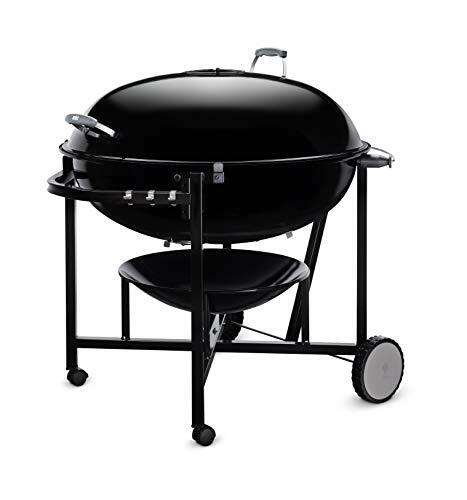 So if you did like it and decide you want it, but need to pay less then there’s always the Weber 741001 Original Kettle 22 Inch, the Weber 14501001 Master-Touch Charcoal Grill 22 Inch, the Weber 14401001 Original Kettle Premium Charcoal Grill, or the Weber 441001 Original Kettle Charcoal Grill 18 Inch. These don’t have Steroids but they are priced between 100 and 200 dollars and are all excellent grills. But the best Grill on the market for under $1500 in undoubtedly Webers 60020 The Ranch Charcoal Kettle Grill. The design looks almost exactly like all previous Weber Kettle Grills, with it’s Jet Black color and stand. The only design difference is the wheels. They’ve put in better wheels, which is the least you’d expect for all the extra money. These wheels make pushing it out into the backyard a much easier task. The wheels needed to be good because it weighs 133 pounds, so if they were even less than perfect you’d be having problems. But they are perfect. The size out of the box measures 42 inches by 37.75 inches by 44.75 so it’s huge and it’s designed for use at large family gathering where people want food fast and you’ve got no time for grilling in batches. Aesthetically, like all Weber Grills, it’s very nice with beautifully finished varnishing and sleek engineering. It could have been a little taller. I felt like the Original Kettle could have had more height and that was one of my complaints, but you can stand while operating both, so maybe I’m being harsh. How much food can you fit on here? Putting in Charcoal midway through cooking is much easier here than on other models because Weber has provided Hinged Grates. You simply put some gloves on, lift up the Grates and sling more Charcoal in. Should be on all Weber models, sadly it isn’t but you do get it here. It works with Wood as well as Charcoal so you can close the Dampers to wood Smoke a Pizza or make Smoked Sausages. Those are two of my personal favorites. This is a huge difference from earlier models because while you could Smoke on the Original Kettle, the result wasn’t great. They where ok, but far from what you can get from a dedicated Smoker. Here you can results comparable to a dedicated Smoker because of the physical integrity of the Steel used to create this model. There’s no air escaping during the Smoking session. I gave a positive review of the Original Kettle Grill but its handles did get hot. That was one of the few complaints people had about it. It was a very popular Grill. So here they’ve taken action and wrapped Nylon around the handles which keeps the heat down. It means you’ll be able to handle this Grill more easily than you would other Weber Grills. If anyone was wondering what ‘reinforced’ means in relation to the handles; it means they triple wrapped the Nylon. So this is a thick Nylon covering. Cleaning is becoming less and less talked about by outdoor Grilling enthusiasts because Porcelain-Enamel is available now on most Grills and it’s on this Grill too. When done well it makes food and other debris just slide off with the application of water. So all you need to do here is take a wash rag, wet it and lightly scrub. They’ve provided a Removable Ash Catcher so there shouldn’t be too much of a build-up anyway. It’s rugged; it’s the mountain man of Grilling. It looks good but it’s a monster of heat retention with those excellent Grates and sheer outlandish size. That’s why they charged over 1000 dollars for this. You simply can’t get something this big and this good for anything under this price. So it’s great if you have a partys outside, or if you’re a Chef, or if you’re a Caterer. It’s also good for large family gatherings. It produces some of the most amazing food I’ve ever tasted on a Grill, so the only problem is the price. It’s expensive at 1200 Dollars and not everyone is going to be able to afford that. But it is selling in huge volumes probably because buyers want to take advantage of the Smoking feature and also because of the size. Remember if you can’t afford this then look at the other Weber models I’ve quoted in this article, many of which I’ve reviewed. They’re not as good as this, but nothing else is. They are cheaper though so you can get a little taste of what The Ranch is like. Thank you for reading.